Deep in the heart of Texas, there is a delightful variety of sage known as Autumn Sage. Actually, it also grows in New Mexico and Arizona, but you get the idea. Considering where it grows, it is an incredibly heat resistant plant and it is often used as a delightful highlight in gardens around the American Southwest. The Latin name for this variety is Salvia greggii, after a Mexican gentleman named J. Gregg who first collected the plant in the deserts of Texas. It is an evergreen shrub that can grow anywhere from one to three feet in width and three feet in height. 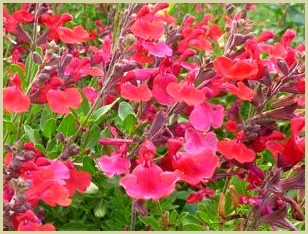 It blossoms into lovely long flowers in the spring, summer and the fall, either in vibrant shades of pink and red or beautiful oranges or yellows. The bright pink flowers are the most popular in American gardens as they are the most heat-resistant of all the autumn sages. The leaves on the autumn variety are small, round or long, and they are dark green with a somewhat sticky coating. These shrubs give off a lovely fragrance. Aside from its colour, its frequent blooms and its hardy nature, another reason why it's so popular in the garden is because it's a magnet for butterflies and hummingbirds! This autumn variety needs full sun and moist soil that enjoys excellent drainage. Remember, this is a desert plant and enjoys desert-like conditions. It can also tolerate partial shade. Pruning in the middle of summer will encourage it to keep blooming for months! Note: The leaves and flowers are edible. Click here for detailed growing tips.